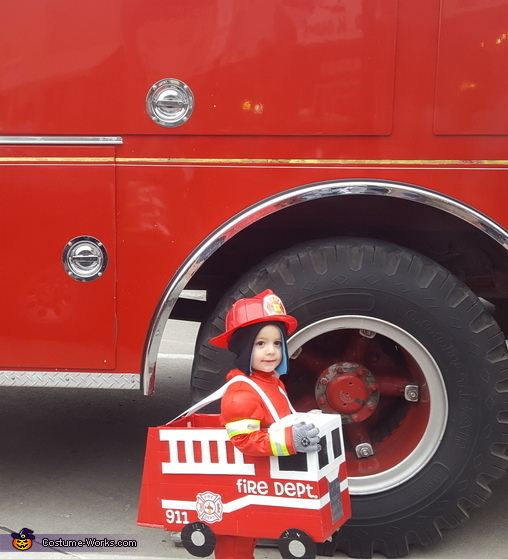 I hand made this fire truck costume for my 2 year old son. He loves fire trucks right now. I started with a diaper box and I used duct tape for the whole box. For the ladder I cut out a piece of cardboard and used white duct tape for it as well. I printed off a fire logo and used foam letters for fire dept. I cut out spots for the working sirens at the top and used old bike reflectors to have a more realistic effect. For the back I used a tiny plastic bottle, a clothespin, and a straw for the fire extinguisher. I used an old dog leash for the hose. Everyone loved his costume this year and he loved showing it off. Thanks!